The Forty-Eighth United States Congress was a meeting of the legislative branch of the United States federal government, consisting of the United States Senate and the United States House of Representatives. It met in Washington, D.C. from March 4, 1883, to March 4, 1885, during the last two years of the administration of U.S. President Chester A. Arthur. The apportionment of seats in the House of Representatives was based on the Tenth Census of the United States in 1880. The Senate had a Republican majority, and the House had a Democratic majority. Washington Monument (seen here in 2006) was completed December 6, 1884. September 5, 1883: Mary F. Hoyt became the first woman appointed to the U.S. federal civil service (and the second person appointed by examination (in which she came top) instituted under the Pendleton Civil Service Reform Act) when she became a clerk in the Bank Redemption Agency of the Department of the Treasury. October 15, 1883: The Supreme Court of the United States declared part of the Civil Rights Act of 1875 unconstitutional, as the Court allowed private individuals and corporations to discriminate based on race. November 18, 1883: U.S. and Canadian railroads instituted 5 standard continental time zones, ending the confusion of thousands of local times. August 10, 1884: An earthquake measuring 5.5 Mfa (based on the felt area) affected a very large portion of the eastern United States. The shock had a maximum Mercalli intensity of VII (Very strong). Chimneys were toppled in New York, New Jersey, Connecticut, and Pennsylvania. Property damage was severe in Jamaica and Amityville in New York. October 6, 1884: The United States Naval War College was established in Newport, Rhode Island. October 22, 1884: International Meridian Conference in Washington, D.C. fixed the Greenwich meridian as the world's prime meridian. November 4, 1884: United States presidential election, 1884: Democratic Governor of New York Grover Cleveland defeated Republican James G. Blaine in a very close contest to win the first of his non-consecutive terms. 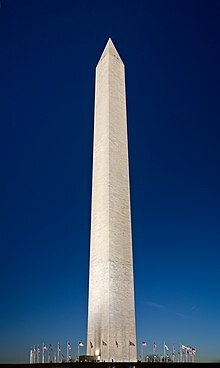 December 6: 1884: The Washington Monument was completed. May 17, 1884: District of Alaska was organized. President: Vacant. Chester Arthur (R), the most recent Senate President, had become U.S. President on the death of his predecessor September 19, 1881, leaving the office vacant through the end of this Congress. Senators are listed by their states and Senate class numbers, which indicate the cycle of their election. New Hampshire (2) Vacant Legislature had failed to elect. Rhode Island (2) Henry B. Anthony (R) Incumbent died September 2, 1884. Clerk: John B. Clark, Jr.
Congressional Directory for the 48th Congress, 1st Session. Congressional Directory for the 48th Congress, 1st Session (1st Revision). Congressional Directory for the 48th Congress, 1st Session (2nd Revision). Congressional Directory for the 48th Congress, 2nd Session. Congressional Directory for the 48th Congress, 2nd Session (Revision).